Before cities, counties or state governments recorded and tracked vital records, local newspapers published articles which detailed these important events. For example, newspaper obituaries contain significant biographical information about the deceased and their relatives. Society pages in New York newspapers began as a way to attract readers with local gossip and news about elite and famous people, but they later evolved and began to cover the daily lives of average citizens. These sections include events, parties, job changes, hospital stays, and social visits by friends and family members. Any information you find in a particular newspaper article may only be available in that article, and may not exist in any other record — that is what makes these records so special and valuable to genealogical research. This New York newspaper article, published in The Newburgh Daily News, was printed only five days after the Titanic sunk in 1912. Survivors began telling their heart-wrenching stories to New York journalists just days after the catastrophe. 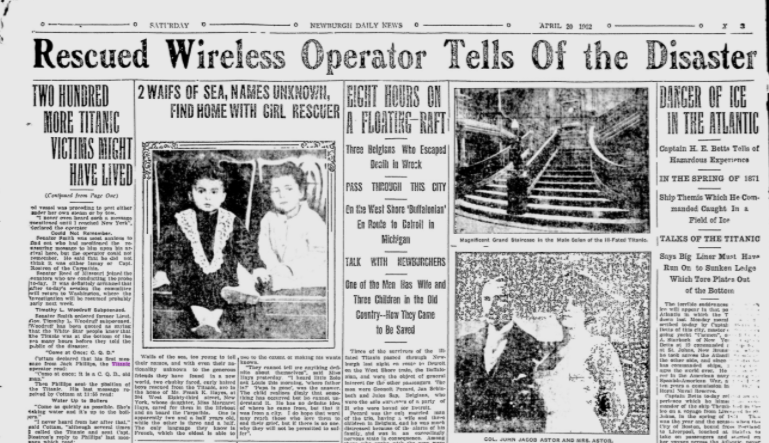 In this article, we learn about Jack Phillips, the Titanic operator who sent this haunting message right before the ship sank: “Come as quickly as possible. She’s taking water and it’s up to the boilers.” We also learn about Frank K. Hayes and his daughter, Margaret Hays, who rescued two young boys from the Titanic and kept them safe in their home at 304 West 83rd Street, New York. As you can see, newspaper articles contain incredible stories, addresses, names, dates, and other critical genealogical information that can reveal new things about your family and what they lived through. This is just one example of the many resources within the New York Newspapers, 1806 – 2007 collection that you can use to learn about historical events and the lives of your New York ancestors. Often, brides and grooms were recorded on separate pages within the marriage index. In SuperSearch, each marriage license record will have a link to a separate page for the relevant bride or groom. 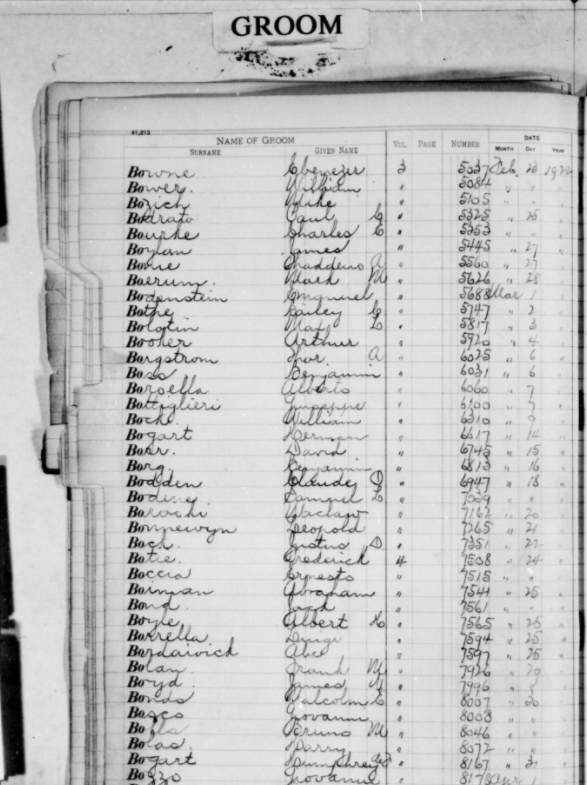 For example, in the image above, see the marriage record with information about the groom, Humphrey De F Bogart, but you must click on his bride, Helen Menkin, to view her information, recorded on a separate page within the New York City Marriage License Index. Known as Humphrey Bogart, the groom was a famous Academy-Award winning actor who performed in Casablanca, The Maltese Falcon, and The Big Sleep. On the Groom’s page of the marriage index record for Humphrey De F Bogart and his wife Helen Menkin, view Bogart’s surname, given name, volume number, license number, and the marriage date. Bride records contain the same information as groom records do in the New York City Marriage License Index, 1908–1929. Below, see Helen Menkin’s matching information including her surname, given name, volume number, license number, and marriage date. As we see from these examples, these records are a treasure trove of information, not only for the genealogical content they offer for those with New York roots, but also for the meaningful historical content they contain. This newly-digitized content is already available for searching in SuperSearch, our global search engine for historical records. In addition, our Record Matching technology will automatically bring you relevant historical records from the new collection that match individuals in your family tree. To access these collections, a MyHeritage subscription is required. You can also search our Collection Catalog to see other collections recently released or updated and browse more than 6,500 collections. We will update you as more newspaper and marriage records are released from around the world so you can continue to advance your genealogical research. Do you have New York roots? Search the New York historical collections today and let us know what you discover! My mother’s family came from New York City. I’ve already found the marriage license for my grandparents in 1908. I expect to find more information in the immigration arrival records. I will be excited to check out records. My family lived in Buffalo NY. Can I get information or is this only NYC info??? Hi Dennie, these collections are for New York State and do not only include New York City. These collections are definitely relevant for anyone researching relatives who lived in New York. I am having great difficulty in researching Martin Denehen and Michael Denehen (Michael arrived Ellis Island around 1896/7 to join his brother Martin who was living in Brooklyn. They both came from Galbally Ireland. I can find no record of when Martin arrived in USA. Can anyone help? I would appreciate ot. Need to find immigration info for my paternal grandfather. Also info on his relatives( mother, father, siblings, and more. Also their place of birth and country. ….His name was Jerome Herl, (possibly also with the name of Heronimous associated in his name). He settled and married Philomenia Phannenstiel in the Hays or Munjor area of Kansas USA.